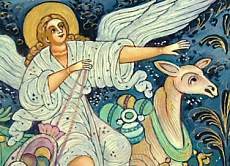 A lovely angel sings as she makes her way through the frozen countryside on the back of a donkey; Her wings spread wide to keep her balance as the beast lumbers through the snow. Sacks of sparkling decorations peek from her sacks, as the tiny fir tree lashed to the saddle waits patiently to arrive at its new home and be dressed to welcome the Savior. The cool blues of the scene enhance the frosty feeling of winter, while imparting a sense of serenity. Twinkling gold and silver accents impart a sparkling feeling of joy and elegance. 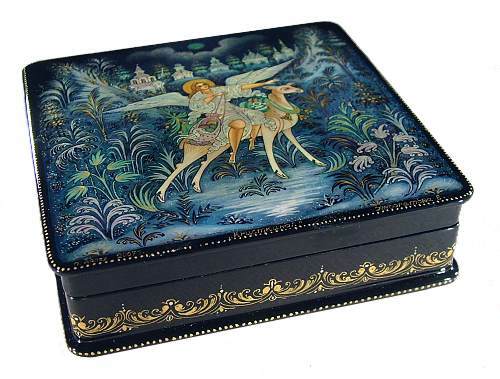 This box is made of high quality papier mache and is signed on the lid with the title, artist's name (E. Nebogatova), village, and date of completion. There is a hinge at the top, and the interior is deep red lacquer. It rests on four round feet. 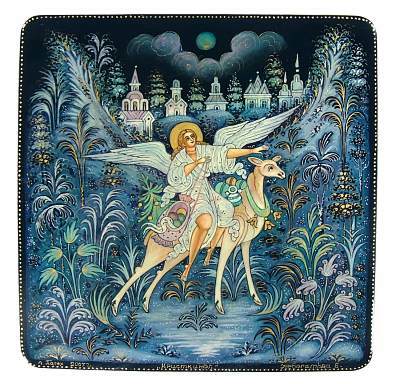 Nebogatova's work is featured in the book "Russian Lacquer, Legends and Fairy Tales".